Jackie largely concerns itself with the four days immediately after the JFK assassination. But the film’s structural conceit is that it frames these days through a meeting with journalist Theodore H. White (though he is never named in the film), who is writing a piece on the former First Lady for Life magazine. Scenes of their meeting are intercut with non-sequential scenes from both before and after the assassination, as well as a brief depiction of the assassination itself. The film also intercuts a later meeting with a priest (played well by John Hurt). If this sounds a little confusing – it is. Perhaps the fragmentary style was intended to reflect Jackie Kennedy’s mental state in the wake of the assassination. But the editing is fragmentary, and not in a well-thought out way. In more than one dialogue scene the film will cut to a different location, with the characters rearranged, and yet the conversation will seemingly continue from where it left off. This defies logic, and means that situations are never allowed to become fully realised or explored. A useful case study of the lack of care afforded to the film’s editing is the conversation in Jack Valenti’s office. The camera begins by swinging between Jackie and Valenti, back and forth to reflect the dialogue. This is good, and helps track the intensity of the conversation. Yet then we get a completely, utterly needless cut, and the effect is ruined. The camerawork reflects this pattern. I usually take no issue with handheld camerawork. But does everything need to be handheld? The claustrophobic effect of repeated handheld close-ups works in a film like Black Swan, where the film places itself close to the protagonist. But Jackie, for all its ostensible focus on Jackie Kennedy, doesn’t do this. Much has been reported about Portman’s extensive research for the role. She received training from dialect coach Tanya Blumstein, and spent hours studying footage and audiotapes of Kennedy. Yet whilst she achieves an eerily accurate aural portrayal, her physical performance isn’t quite right. 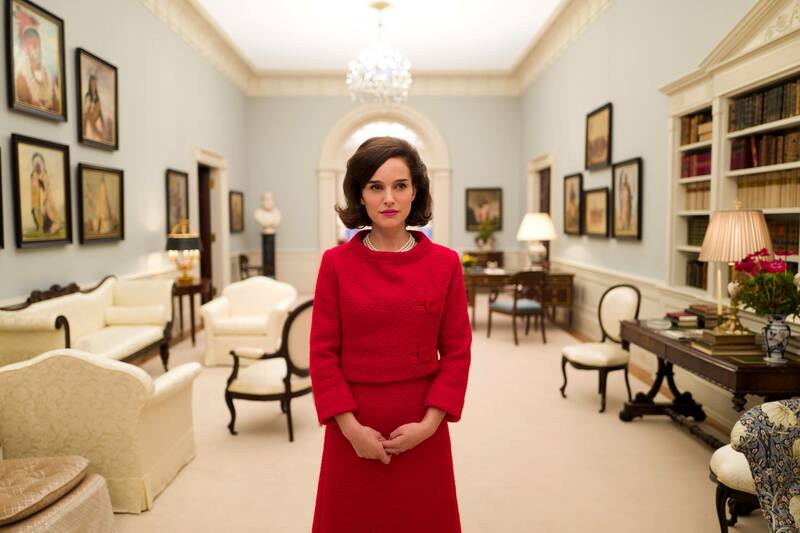 In the sections where the film reproduces scenes from the 1962 documentary “White House Tour with Jackie Kennedy”, Portman plays the First Lady too stiff, too austere. The real Jackie, whilst poised, smiled with her eyes and came across as far more…human. Part of the issue here is the direction and script. A montage shows Jackie drinking a few different types of alcohol in a few different rooms of the White House, whilst listening to “Camelot” at full volume. This is the closest the film gets to exploring the deep intricacies of her anguish. On the whole, the film keeps a marked distance, and suffers for it. The depiction of the funeral procession is, like most of the film, intercut with Jackie’s exchanges with the journalist. In their conversation, Jackie finally acknowledges to White the ‘pageantry’ of the burial procession: “I didn’t do it for Jack, I did it for me.” The film then immediately cuts to a close-up of her veiled face, mid-procession. It is clear that we are meant to think of this as a revelatory moment. Yet this revelation is not earned — is not even really a revelation. We know she was doing it for herself. We have known it for a while. While Mica Levi’s score is strange and harrowing, it is let down by its deployment to accent these moments of pseudo-revelation. Of the two Kennedy brothers, Peter Sarsgaard is the lesser doppelganger, but gets the far larger part. His quiet intensity and calm vigor is effective at cutting through the scenes of political disorder. This is the film’s standout performance. Yet Jackie remains thoroughly frustrating. It could have been a very good film. Instead it is a mishandled film. Originally published in the Cherwell newspaper, 18 February 2017.